e Crimson-collared Tanager, Ramphocelus sanguinolentus, is a rather small Middle American songbird. It was first described by the French naturalist René-Primevère Lesson in 1831, its specific epithet from the Latin adjective sanguinolentus, "bloodied", referring to its red plumage. This species is sometimes placed in a genus of its own as Phlogothraupis sanguinolenta, and a genetic study suggests that it is less closely related to the other Ramphocelus tanagers than they are to each other. Its closest relative is the Masked Crimson Tanager. Crimson-collared Tanagers average 19–20 cm (7.5–8 in long. 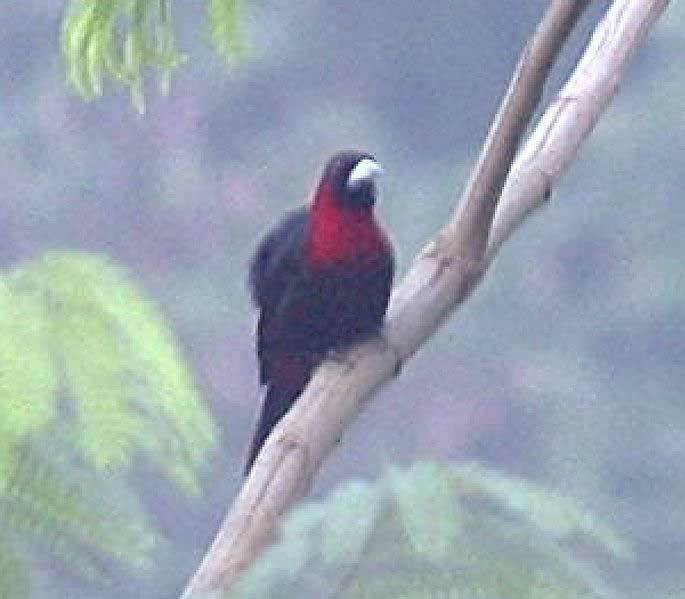 The adult plumage is black with a red collar covering the nape, neck, and breast (remarkably similar to the pattern of the male Crimson-collared Grosbeak). All tail coverts are also red. The bill is striking pale blue and the legs are blue-gray. In adults, the irides are crimson, contrary to what is shown in Howell & Webb. Females average slightly duller than males, but are sometimes indistinguishable from them. Juvenile birds are similar except that the hood is dull red, the black areas are tinged with brown, and the breast is mottled red and black. Young birds also have a duller bill color. The Crimson-collared Tanager ranges from southern Veracruz and northern Oaxaca in Mexico through the Atlantic slope of Central America, to the highlands of western Panama. It inhabits the edges of humid evergreen forests and second growth, where it is often seen in pairs at middle to upper levels. The nest is a cup built of such materials as moss, rootlets and strips of large leaves such as banana or Heliconia, and is placed at middle height in a tree at a forest edge. The female usually lays two eggs, pale blue with blackish spots. 2. ^ a b c d e f g h Steve N. G. Howell and Sophie Webb (1995). A Guide to the Birds of Mexico and Northern Central America. Oxford University Press. pp. 676–77. ISBN 0-19-854012-4. 3. ^ S. J. Hackett (1996). "Molecular phylogenetics and biogeography of tanagers in the genus Ramphocelus (Aves)". Molecular Phylogenetics and Evolution 5 (2): 368–382. doi:10.1006/mpev.1996.0032. PMID 8728395. 4. ^ Hill, Armas (2006). "Panama Birds during FONT Birding & Nature Tours". Focus on Nature Tours. http://www.focusonnature.com/BirdListAllPanama.htm. Retrieved 10 July 2006. * F. G. Stiles and A. F. Skutch (1989). A guide to the birds of Costa Rica. Cornell University Press. ISBN 0-8014-9600-4.